Want to give your partner a gift that will last a bit longer than the occasion you’re celebrating? 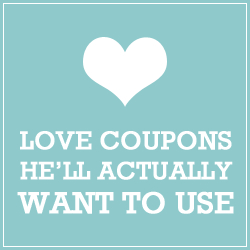 Give them a set of romantic love coupons they’ll be dying to use for weeks to come! To download the love coupons, click on the image below. For best results use your printer’s highest quality setting and consider using card stock or even photo paper.